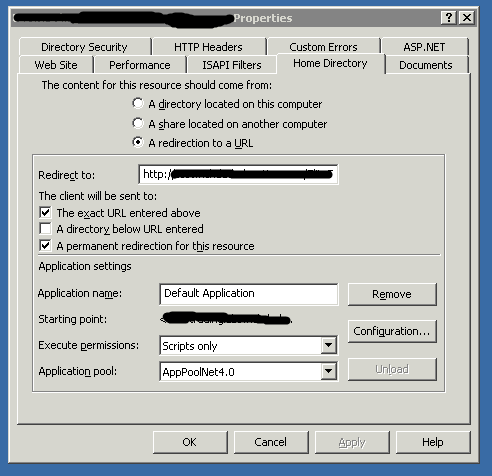 To do this in IIS 6, simply open the website properties in IIS 6, select “a redirection to a URL” and enter the URL. If you would like instructions on how to perform this via IIS 7, let me know and I can upload these screenshots as well. Posted on April 2, 2013, in Uncategorized and tagged 301, iis, iis 6, iis 7, permanent, redirect. Bookmark the permalink. Leave a comment.